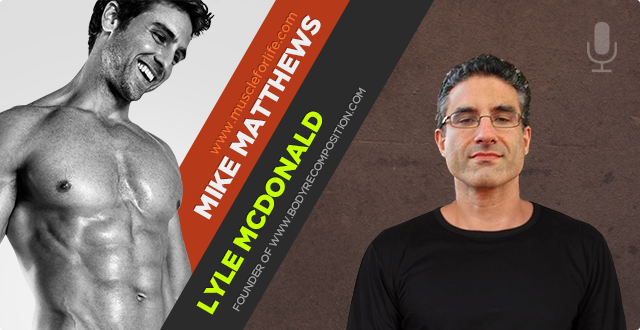 In this podcast I interview the one and only…the inimitable Lyle McDonald. Lyle is a health and fitness researcher and writer, and I have to say, one of my favorite authors in the space. He’s the first person that I found in my journey whose work really resonated with me, so it’s pretty cool to sit down and chat fitness with him. What I like most about his work is not just that he really knows his stuff and deals with subjects very holistically, he also does a fantastic job breaking down dense, complex subjects in terms that anyone can understand. In this interview, we talk about a subject that has consumed much of Lyle’s life for the last year and half or so, and that’s female fat loss. Specifically, he breaks down how things differ between men and women in the realm of losing fat, and especially when we’re talking about getting really lean. As Lyle points out, the fundamentals like energy and macronutrient balance are what they are, but the strategies that work beautifully for men wanting to get shredded won’t necessarily work as well for women. In fact, you can count on them being far less effective, and Lyle dives into why, and what you women can do to squeeze the absolute most fat loss out of your diet and training. I hope you like the interview! 4:26 – How are women different from men? 22:40 – What are your top tips for better results in losing weight? 32:10 – Tips on the exercise component of weight loss. 38:04 – What is a refeed and does it help? 43:57 – Do flexible dieting and “If It Fits Your Macros” help? 1:19:55 – Where can people find you and your books? 7:20 – How are women different from men? 25:34 – What are your top tips for better results in losing weight? 35:04 – Tips on the exercise component of weight loss. 40:58 – What is a refeed and does it help? 46:51 – Do flexible dieting and “If It Fits Your Macros” help? 1:22:49 – Where can people find you and your books?